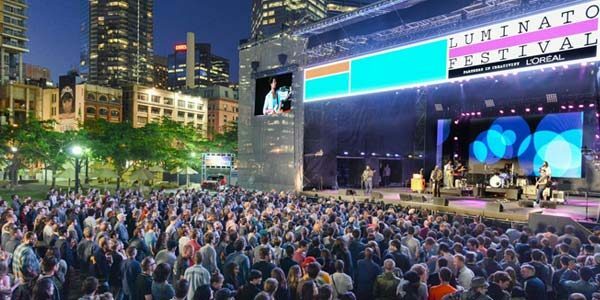 The Luminato Festival is back to celebrate the world’s art and creativity, as one of the best summer kick-offs Toronto has to offer. 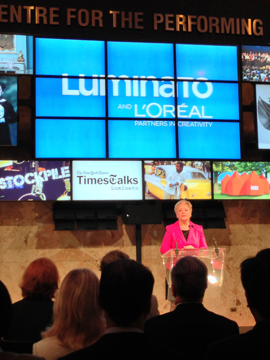 The prestigious Luminato Festival takes place this year from June 14-23, in Toronto’s downtown core. First launched in Spring 2007, the Festival is an annual 10-day celebration of art and creativity, welcoming hundreds of artists, designers and performers from all over the world to share their talents with the general public. The festival’s “Hub”—its central spot for attractions and info—will be at located at Toronto’s David Pecaut Square. The Luminato Festival brings together all art forms: from fashion and dance to magic and a literary picnics. Devoted art-lovers and those who know little outside the world of colour-by-numbers will find shows, exhibits and activities that speak to them. There is truly something to do for everyone. A cool new feature this year is the festival’s newspaper, dubbed “Light News”. It will be a limited addition daily publication that will be treated as a part of the program, rather than just a form of communication. Items like overnight reviews, candid photos and exclusive interviews will be included in each issue. One exhibit that stuck out to me is the Music Mob afternoon concert—happening on June 22 at 2 p.m. The Mob welcomes everybody and anybody in the area to join forces and perform a song side-by-side with members of the Toronto Symphony Orchestra. They ask enthusiastic volunteers to show up at Hub with an instrument of their choice. Be it a guitar, violin, triangle, harmonica or simply a set of vocal cords, everyone is welcome to partake in this musical event. This is all in celebration of the 200th birthdays of famous musicians Richard Wagner and Guiseppe Verdi. Complete details are available on the Luminato website, including practice sheet music. Another aspect the festival is known for is the food! This year, they’ve got you covered with portable restaurants by Food Truck Eats for lunchtime meals. And the Future Tastes of Toronto program will have young chefs-in-the-making serving you dinner. Local Toronto chefs will be working with children in grades 4-6 to develop both a love for culinary arts, and skills to prepare delicious food for visitors during the festival. 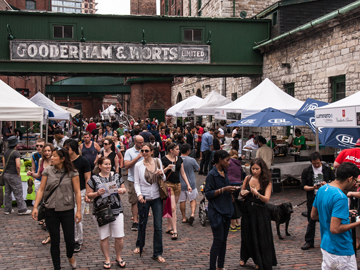 Be sure to check out Toronto’s Distillery District during the festival for some gourmet on-the-go eats. Over the 10 days there will be hundreds of shows, exhibits and interactive attractions to enjoy. There are multiple concerts to see by artists such as K-OS, Serena Ryder and Lady Son. World renowned Marina Abramovic will be lecturing and performing during the festival and the Mark Morris Dance Group will be holding a movement and dance workshop—free of charge—in collaborations with the Toronto Dancing with Parkinson’s group. The list of fun things to check out seems to go on forever, and with most exhibits boasting free admission, this 10-day festival is a must! For a full list of attractions and background information check out the website at www.luminatofestival.com.